U.S. trade with the world continues to expand, and that is reason for cheer. Exports have now made a complete recovery from pre-recession highs, growing at double-digit rates in the past few years. If nothing else, this suggests that exports have picked up a lot of the slack that was left by the housing and construction collapse; the U.S. economy is changing dynamically in response to an unexpected and massive shock. Imports are closing in on their prior highs, reflecting a relatively robust recovery in consumer demand in the U.S., which is impressive since employment is still far below prior highs. Can the US become an exporting powerhouse? I think it can. I surmise that China is the last large low-cost manufacturing platform on the planet, and it is not going to be low-cost for too much longer, as in 10-15 years. 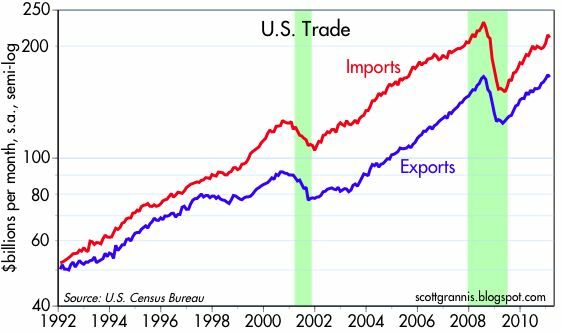 If the dollar can stay in a range that enhances exports and trade, we may find ourselves exporting more than ever. All good news, I'd say. U.S. imports have carried a lot of the world's economy for the last decade. Most of the growth of U.S. GDP for the last year has been exports. The U.S. has moved much into high-tech manufacturing, bio-tech, software, energy conservation tech and services. These are all segments that should provide export growth if intellectual property is protected in foreign markets.